I’m thrilled to be here today for the 2015 Bake Craft Sew Decorate Series! 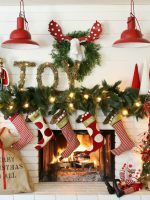 Over at Reasons To Skip The Housework, I share all kinds of ideas for decorating, cooking, playing, creating, and celebrating. 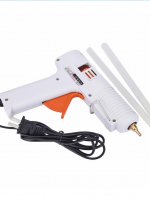 Basically, anything you can do while skipping all the housework! 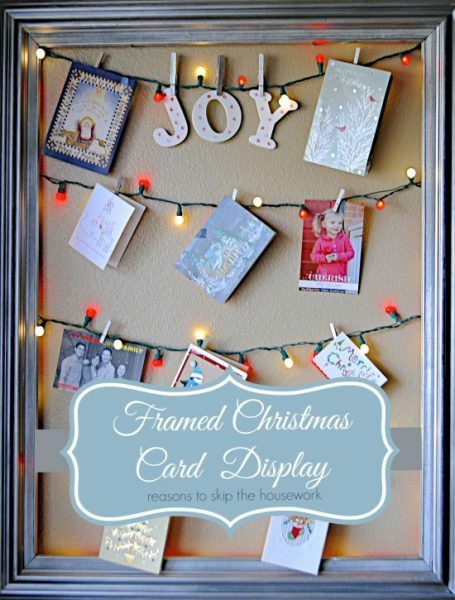 The holidays are the perfect time to craft and decorate. 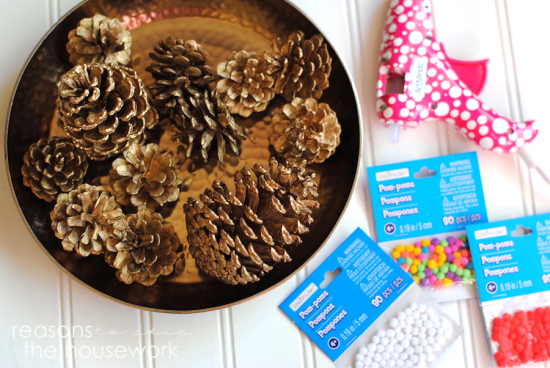 Sometimes it’s hard to find a decor idea that my girl can help me make, but when I saw these Pom Pom Pinecone Ornaments that Debbie from One Little Project made, I knew it was a project that my girl could do with me. 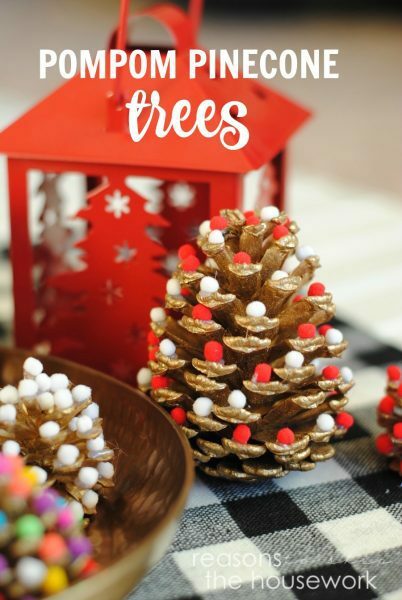 These Pom Pom Pinecone Trees are the perfect Christmas Decoration that the whole family can help make! 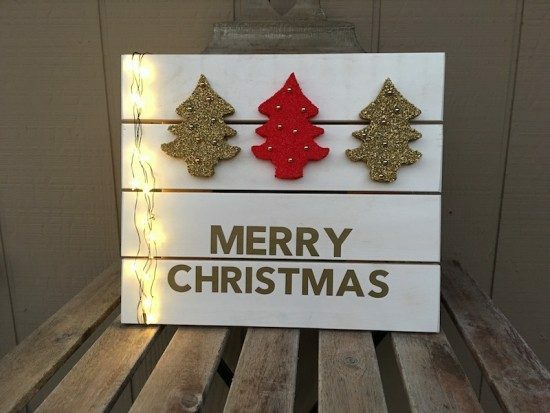 We are moving in 10 days, so we don’t have our tree out or even close to being up, for that matter – so I knew that any decor we were going to have out was going to have to be something that could sit on the one living room table that was still left! I decided to turn Debbie’s ornaments into table decor, and they’re so much fun! 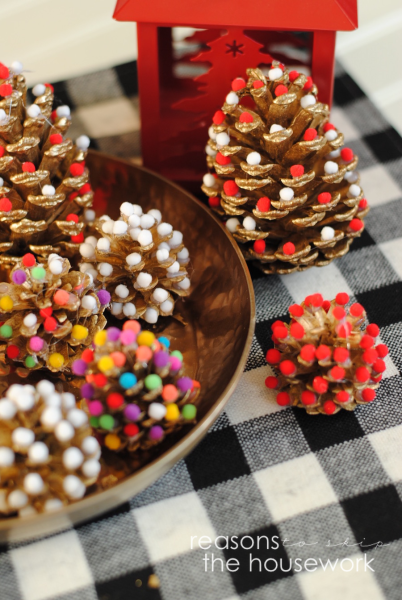 You’ll also need: mini pom poms and a hot glue gun to make Pom Pom Pinecone Trees. 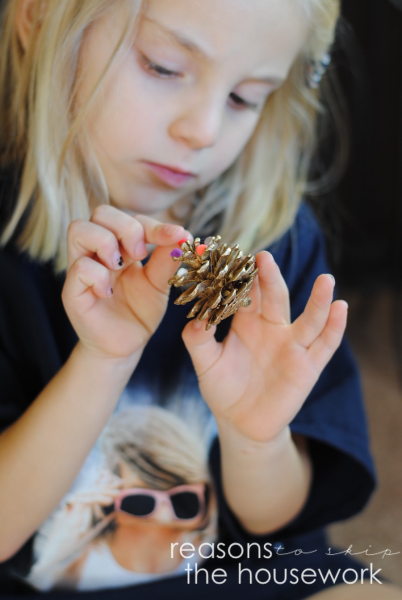 Add a small dab of glue to each “leaf” of the pinecone, and place a pom pom into the glue. 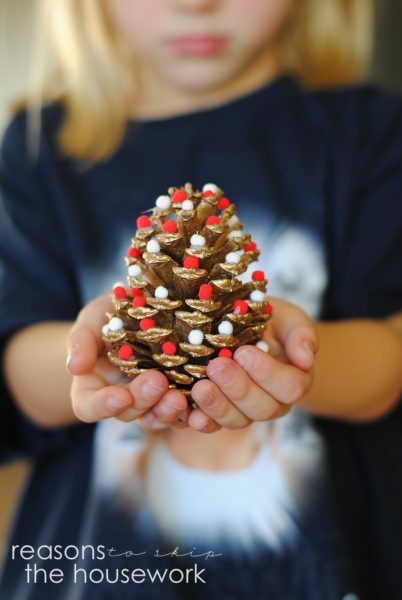 Work your way around the entire pinecone, and BOOM – you have super adorable Pom Pom Pinecone Christmas Trees! 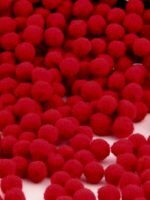 There are a bunch of other ways to decorate your home – over on RTSTH- come enjoy some fun ideas and let the laundry sit a bit longer! Thank you so much Melanie!!! 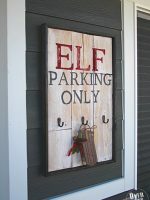 This is so cute and totally kid-friendly which is fantastic for us! Love it!!! Be sure and follow Melanie on her blog, Reasons to Skip the Housework and on Facebook, Instagram and Pinterest.